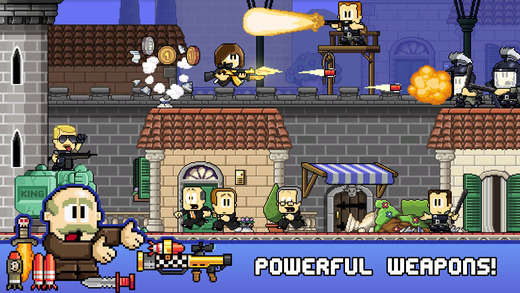 After today's earlier Kami 2 review, SuperPhillip Central continues to seek out interesting mobile releases with Halfbrick Studios' latest, Dan the Man. Is this game by the dev team behind Fruit Ninja and Jetpack Joyride worthy of standing next to those great games? Dan, Dan. Dan the Man. If he can't do it, no one can! From the makers of Fruit Ninja and Jetpack Joyride, Halfbrick Studios, comes the team's latest title, a game based on a web series, Dan the Man. Without much context to the game, the story portrayed here is a bit confusing. Who the heck is this army of characters, what's up with the two dudes-- one bald and one with a hat, and just what in the world is going on? It says something then, that even without a cohesive story to its name that Dan the Man ends up being an enjoyable platformer/beat-em-up. 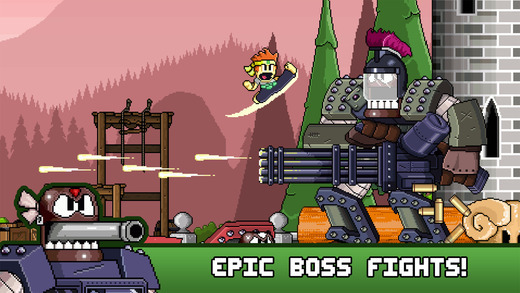 One thing I was worried about with a platformer with beat-em-up combat was the touch controls. Sometimes a game of this type can be let down by its touch-based inputs. Thankfully, this is not the case with Dan the Man. All it needs is its left and right movement inputs on the left side of the screen and its attacking, jumping, and special weapon buttons on the right side. However, if you want a more traditional experience, you can use an MFI controller for analog inputs, which was my preferred way of playing. Regardless, it's great that the standard touch controls work well, and that you have the option of playing with analog inputs if you so desire. There are 16 levels in total in Dan the Man, and they are split up among four worlds, if you will. They are quite lengthy too, usually taking at least five minutes even when rushing through them, and up to ten minutes if you're playing more leisurely or exploring levels for secret areas. I would have enjoyed more bite-sized levels for convenience's sake, but there are ample checkpoints throughout. Still, many levels can feel long in the tooth, especially with all the "fight rooms" that impede your progress until you clear out the area of enemies. 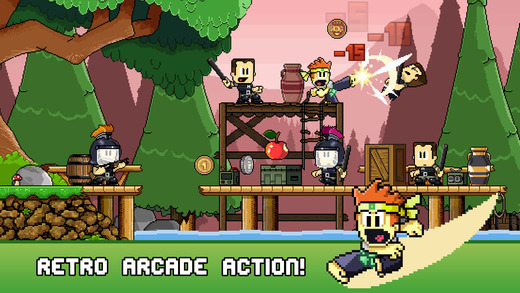 At the end of each level, your point total is accumulated based on how many enemies you defeated, secret areas found, damage you took, and how many objects you broke-- true to the style of the arcade games Dan the Man is inspired by. The story mode won't take any more than a few hours to beat. The difficulty slowly increases as you play through the levels and worlds, introducing a steady amount of new, harder, more resilient enemy types, new obstacles and hazards to concern yourself with, and more challenging platforming bits to overcome. The game being but a few hours length-wise for a first play-through makes for an adventure that doesn't overstay its welcome. In fact, you might want even more after you've vanquished the impressive and enjoyable final boss. That's where the two alternate modes of play come in for Dan the Man. One is an arena-style brawler that pits your character in a variety of battlegrounds, needing to take out all enemies in a set amount of time to get as high as score as possible. The other mode presents daily challenges to the player, where completing them nets some rather snazzy prizes in the form of coin bonuses. Coins are a precious commodity in Dan the Man. They have a variety of uses to them, from upgrading each of the playable characters' fighting abilities in between levels to buying helpful inventory items from in-game shops that appear frequently throughout levels. These items include things like revitalizing potions that save your bacon when your health runs out or temporary weapons like shurikens, shotguns, and even explosive RPGs. Outside of typical platforming in Dan the Man (which some can be a bit difficult as it can be hard to distinguish what you can and can't jump on occasionally), the combat reminds me a little of the Double Dragon series. There are kicks, punches (both from the ground and in midair) to unleash on foes, as well as holds and throws, performed by holding a direction while standing close to an enemy. It's a lot fun, frenetic action that is simple enough to be learned and perform with the controls, but mindless button mashing won't do you any favors. It's all about picking your shots and thinking ahead to avoid damage. However, not all is perfect with Dan the Man, and there are two big issues I have gameplay-wise. For one, the knockback that Dan receives upon taking damage is insane. It has Dan rocketed backward, and this is only compounded by the second issue: there are no invincibility frames for Dan. That is to say that when you take damage, you can sort of be like a pinball, bouncing off hazardous objects and projectiles to quickly find yourself killed. It doesn't happen all the time, but when it does, it's maddening. Enemies also get knocked back from punches, so both the player and enemies are on even ground there, but at the same time, enemies don't have to go the entire level. Still, death isn't a major blow to the player. Through watching a video or playing 200 in-game coins, you can revive yourself from the last checkpoint you came across. Most checkpoint signposts where progress is saved let you pass by freely, but sometimes a 30-second ad plays. These can be removed entirely by paying the premium price of $2.99. This also results in statues bestowing you with rewards when you pass by them instead of needing to break them and watch their videos to get the same reward. Other in-app purchases consist of new playable characters and bundles of coins. None of these IAPs are required to enjoy Dan the Man. With Dan the Man, Halfbrick Studios has successfully created another winner. With a fair ad and pricing model, satisfying gameplay in both its brawling and its platforming, beautiful art, and respectable level design, Dan the Man delights in many ways. Yes, some of the gameplay issues do detract from the experience, and levels can be a bit too lengthy, but overall, Dan the Man is a short but sweet adventure from beginning to end.